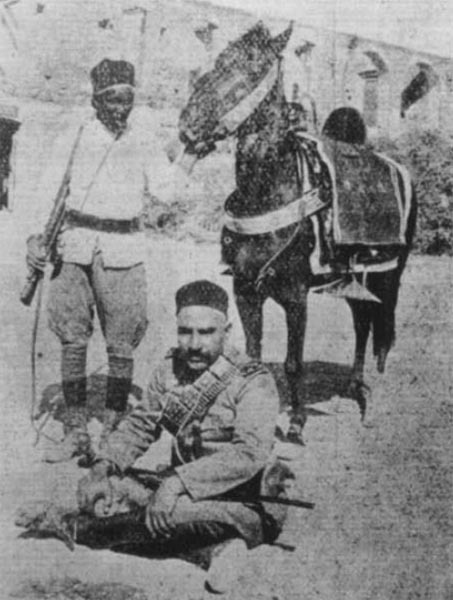 A Turkish officer and his African batman in Libya. Turkish and Libyan guerilla forces maintained their resistance throughout the war, effectively penning the occupying Italians against the coast. Western Desert: c. 130 Turks and munitions, landed from U35 at Bardia, reinforce Senussi. Eastern Mediterranean: U35 sinks RN armed boarding steamer Tara and Egyptian coastguard vessel Abbas following day at Sollum. U35 has already landed 10 Turkish officers, 120 men (in 2 towed schooners) and ammo at Bardia for Senussi in first-ever submarine clandestine landing operation. Western Russia: Germans heavily repulsed at Platonovka, south of Sventen (Dvinsk). Serbia: Fall of Nis after 3 days fighting to Bulgar First Army gives Central Powers rail link with Turkey (German munition convoys arrive at Ruschuk following day. French 57th and 122nd divisions begin advance to 2 1/2 miles west of Crna until November 9. Salonika: British 22nd Division (from France) begins landing (all infantry arrived by November 10). Eastern Front: German Army airship LZ39 (hitherto bombing rail targets in Poland) destroyed in shed fire near Grodno. Neutrals, USA – First steam catapult launch of aircraft from a ship: Curtiss flying boat (pilot Mustin) from bows of anchored battleship North Carolina in Pensacola Bay, Florida (repeated while underway following day). South Africa: General De Wet declares for Britain in election campaign (released with 118 others on December 20).